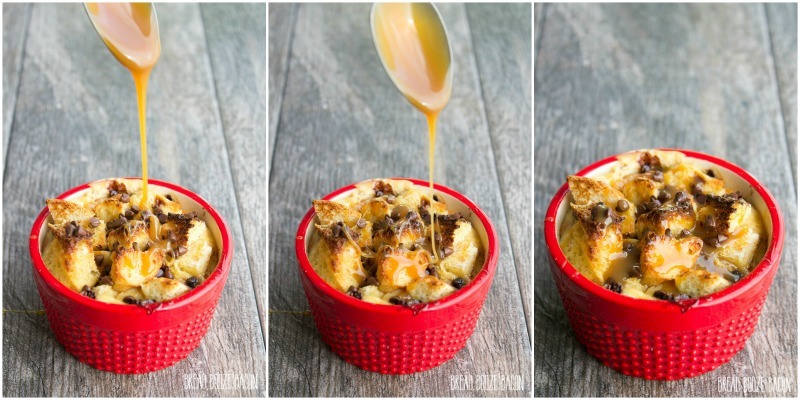 Caramel Chocolate Chip Bread Pudding for Two are little cups of deliciousness perfect for a date night in or when you don’t feel like eating an entire cake! I know most of you probably don’t think bread pudding when you think romantic dessert for two, and that’s okay. Today we’re going to change that. 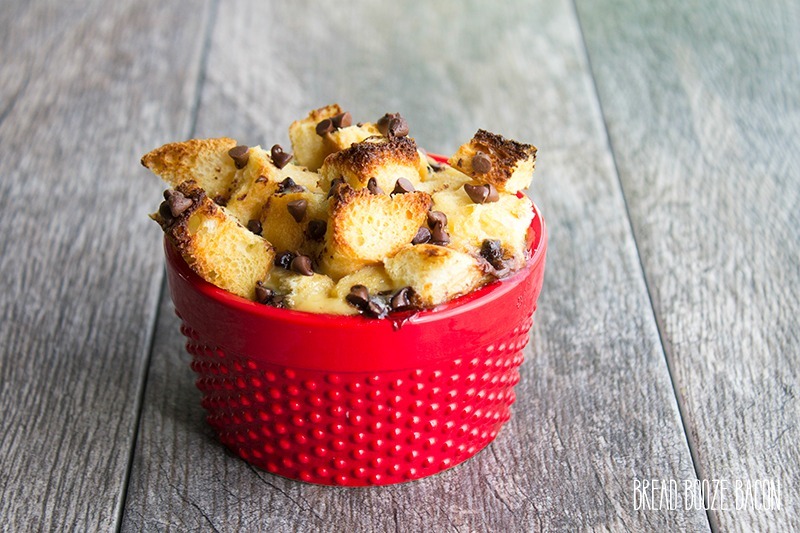 Bread pudding is one of those comforting, almost french toast reminiscent desserts that you can make just about any flavor under the sun. 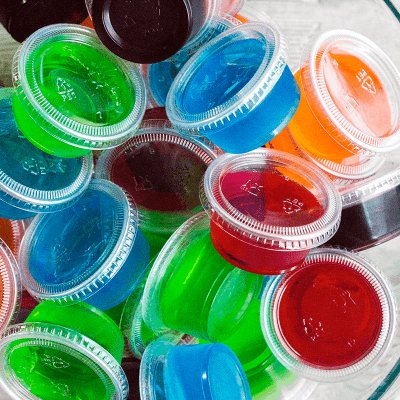 It’s a memory from your childhood, and there’s nothing better than ending a good meal with a dessert that brings back fond memories. At my house we always at bread pudding around the holidays (AKA Thanksgiving & Christmas), but this is one of those desserts your can (and will) eat year round. Especially when it’s so easy to make a two person portion. 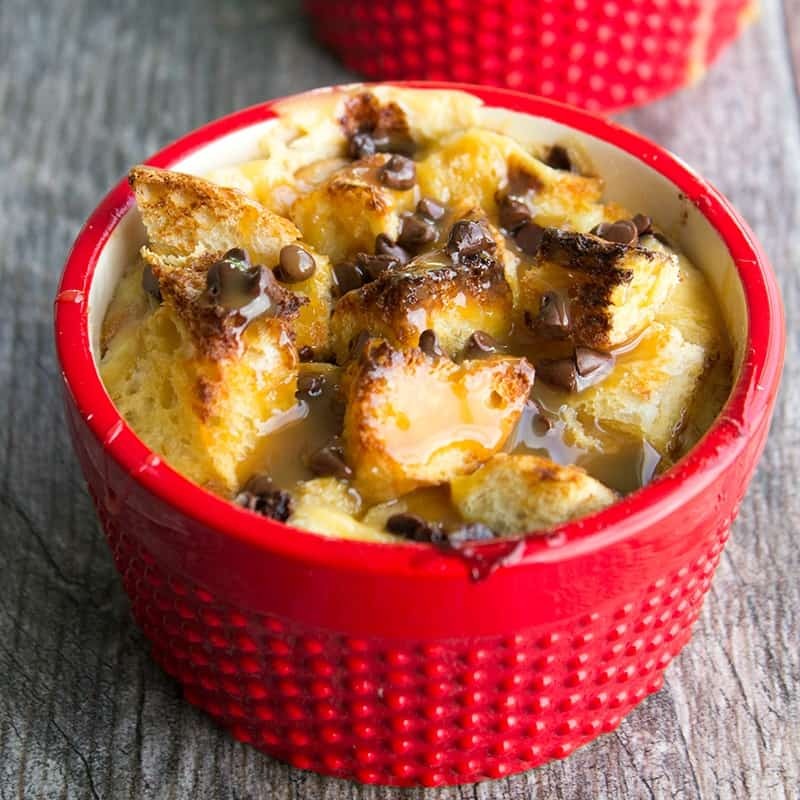 The bread pudding is creamy and tender with bursts of chocolate breaking through and the caramel sauce lets you decide just how sweet your want this dessert to be. I may have even topped it with some vanilla ice cream before adding more caramel and chocolate chips. The pudding was asking me to. It was awesome. Do yourself a favor, make this dessert tonight. 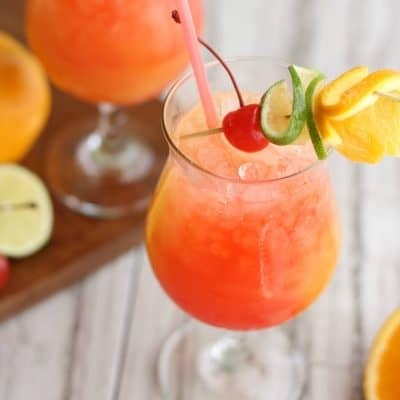 It’s super easy, portion controlled (even though you’ll want to east the second cup yourself), and will give you that warm fuzzy feeling a good dessert should. 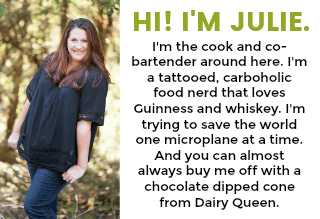 If this is you first time joining us for 12 Bloggers, here’s the skinny minnie! 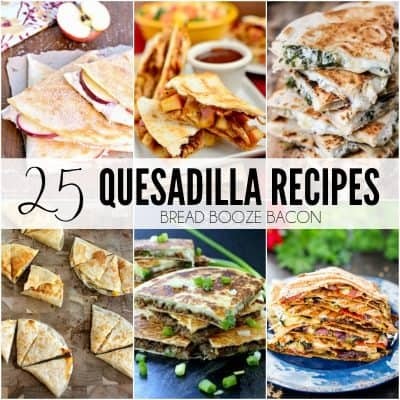 Each month we join 11 other bloggers on the 12th to bring you 12 themed recipes all made with 12 ingredients or less. Get it?! 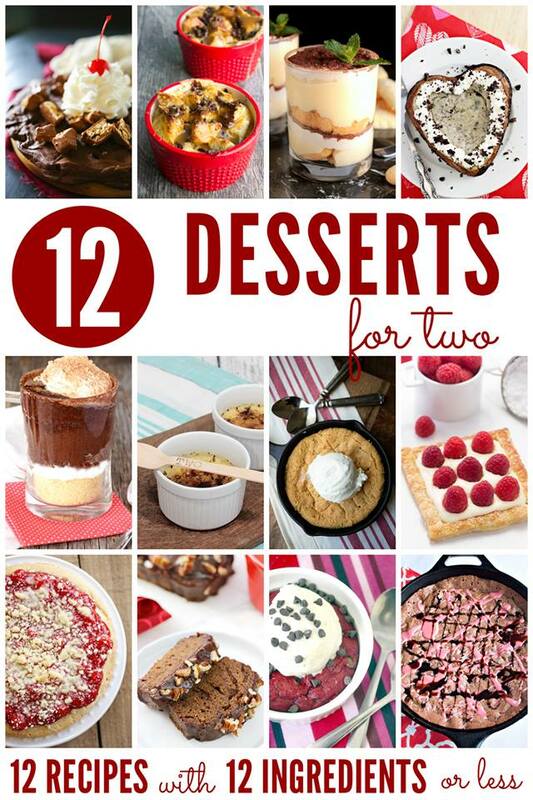 This month it’s all about dessert for two. Desserts perfect for a date night in or when you can to have something special for dessert, but don’t need an entire pan of brownies staring at you…like we had at our house this week. *sigh* I love you brownies! It was worth it. 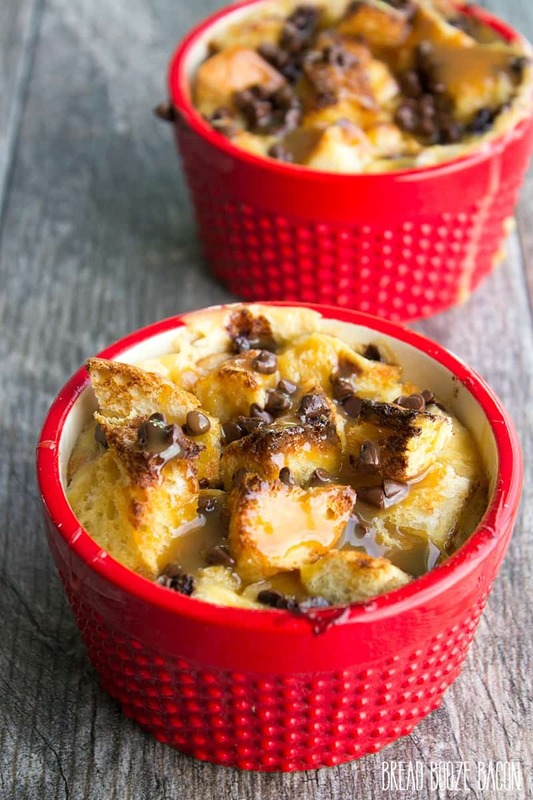 Caramel Chocolate Chip Bread Pudding for Two are little cups of deliciousness perfect for a date night in or when you don't feel like eating an entire cake! In a mixing bowl, whisk together the milk, brown sugar, sugar, caramel sauce, vanilla, and salt until evenly combined. Using two 3 cup ramekins, portion 1/4 of the bread into each of the ramekins (filling them each about half way full). 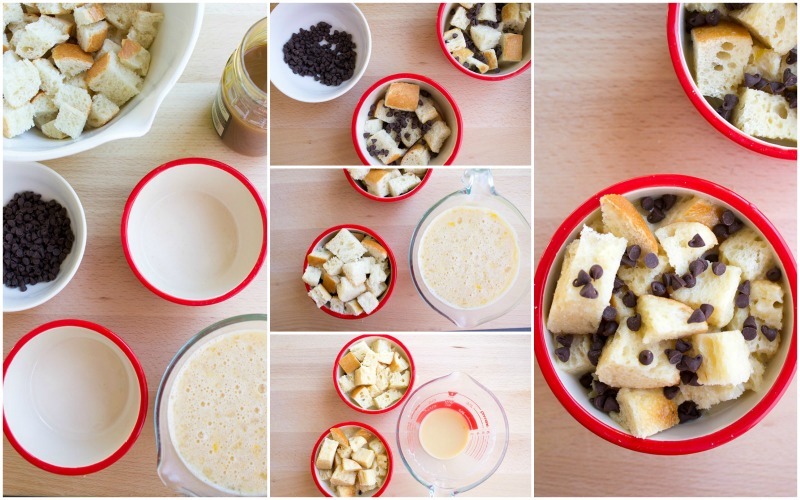 Sprinkle 1/2 tablespoon of chocolate chips over the bread in each ramekin. Divide the remaining bread between each ramekin. Pour half the milk mixture into each of the ramekins over the bread. (You might have some of the milk mixture left over. The milk mixture should reach the top edge of the dish.) Using your finger tips, gently press the bread into the milk to help it soak up the liquid. Divide the rest of the chocolate chips over the top of the pudding in each ramekin. Place the dishes on a baking sheet, in case the pudding bubbles over. Bake for 30 minutes. Carefully remove from the oven. Spoon more caramel sauce over the warm pudding, to taste. Serve warm. 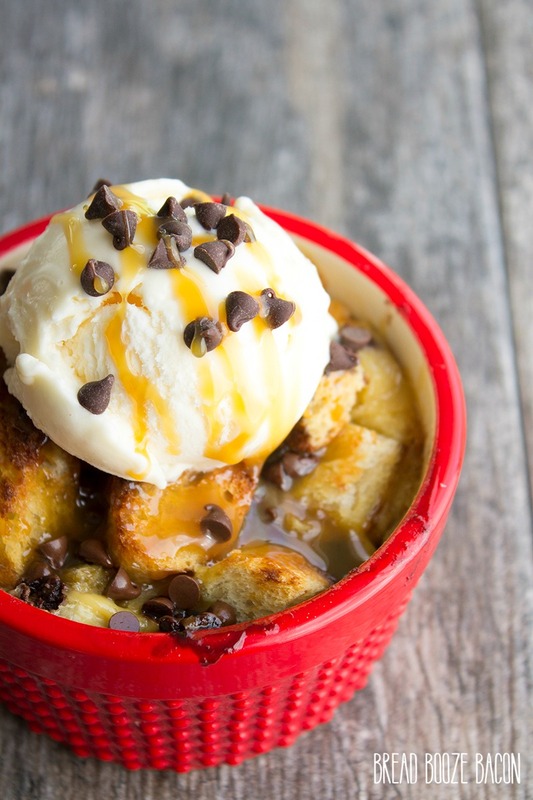 If you want to take your dessert up a notch, top with a scoop of ice cream, drizzle with even more caramel, and sprinkle with chocolate chips.